When you are about to partake in an experience like indoor skydiving you aren’t quite sure what to expect. A thousand questions rolled through my head about the logistics of it. Will we be falling off of a sheer cliff? Will there be parachutes involved? Of course, the answer is no, but I had to step inside to find out. 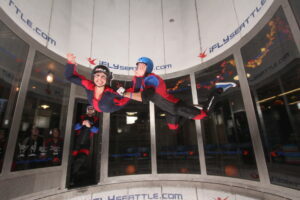 Kim Edwards soars at iFLY Seattle. Photo courtesy of iFLY Seattle. Once inside the building, we were greeted by a member of the iFLY Seattle team who was genuinely excited about the fact that we were all first-time flyers. After a brief introduction, we were directed to a wall of touch screen monitors where we entered in our registration information and received a brief education about what iFLY was all about, and of course, we signed a waiver with all of the perfunctory cautions and warnings that you might expect. During the sign-in we could hear the wind tunnel starting and our curiosity began to build. Finally done with the registration process, we were greeted at the bottom of the staircase by our instructor, “Big Mike.” Moving excitedly up the staircase, we finally got our first look at the wind tunnel, which is far less menacing than I had previously thought. It’s a self-contained, clear plexiglas “smile factory.” First things first though – we had to actually learn how to fly before we could step into the tunnel. With anxious anticipation, we chose our seats in the “classroom” and, led by Big Mike’s witty dialogue, rehearsed the body positions that would maximize our flight experience. We also learned four hand signs that the instructors might give us during the flight in order to change something about our posture to make us more aerodynamic. The video was brief and spared the corny infomercial feel of your average instructional video. Once we were out of the class we lined up and received our flight suits. If you ever wondered what it felt like to be a flying squirrel, that question will be quickly answered after you get the suit on. They fit comfortably over jeans and T-shirts, but shoes with laces are a must. Anything “slip-on” will get quickly sucked off your foot and puréed in the fans below. At this point we were fully geared with goggles, helmet, and flight suit and were ready to step into the waiting tank. Mike asked for volunteers and, needing to satisfy my curiosity, I quickly shot my hand into the air. I will admit, for an overly risky, somewhat careless person like myself, I was experiencing some pre-game anxiety as I walked toward the edge of the wind tunnel. You can feel the air ripping upwards, powered by two enormous fans below, and all that’s there to break your fall is a layer of mesh netting. Standing at the edge, I looked at Mike and after I got the thumbs-up, I leaned myself into the wind. The only word appropriate for what I experienced next is e-la-tion: great happiness and exhilaration. Experiencing absolute weightlessness is an incredible thing, and the 60 seconds that you are in the tunnel seem to stretch on forever. Initially gaining your balance is a challenge, but the instructors do a good job of giving you tips and feedback during the flight. After we all had ooh’d, awed, and laughed our way through our first round of flights we were treated to a Spiderman like display of air acrobatics. Between the flips, splits, barrel rolls, and death plummets, I’m not sure which maneuver was more impressive.